When Governor Perry recently released his Energy Plan, I noted in my review that it bore a close resemblance to the position paper prepared by CERA for the API and that it could be, in consequence, considered perhaps the “best shot” of the oil and gas industry in predicting where new North American resources might come from in the next couple of decades. One distinction that I did not make and that is somewhat difficult to decide is the extent to which these events will come to pass, regardless of who is the next President. If one looks at the different regions that are suggested as sources to increase oil availability for the United States, I have largely discussed the various options, whether the Bakken Shale, the off-shore resources of Alaska, the Gulf of Mexico, and the gas shale reserves such as the Marcellus. One of the two regions and resources I had not covered was the increase in production that can be anticipated from the Niobrara shales of Colorado, Wyoming, and adjacent states. (The other is the offshore Atlantic). Since this is a new enough development that it may not be well known, I thought to mention some basic information about the Niobrara in this post. The development of fuel sources from the fine-grained shales that cover much of the country has been one of the great success stories of the past decade and the proliferation of natural gas that it has generated has helped keep the price of that critical fuel low, thereby providing an advantage to American industry. And if one looks at the shale plays potentially available around the country, there are a number that have yet to be developed significantly. I am not sure why this was singled out relative to a couple of others as being the only likely benefit of the Governor’s attention, nor what gains would be made in terms of either production or jobs from any action the Governor might make as President, given that in the same way as with the Bakken, the drivers are much more likely to be geologically and oil-price driven than they are regulatory, particularly at the Federal level. 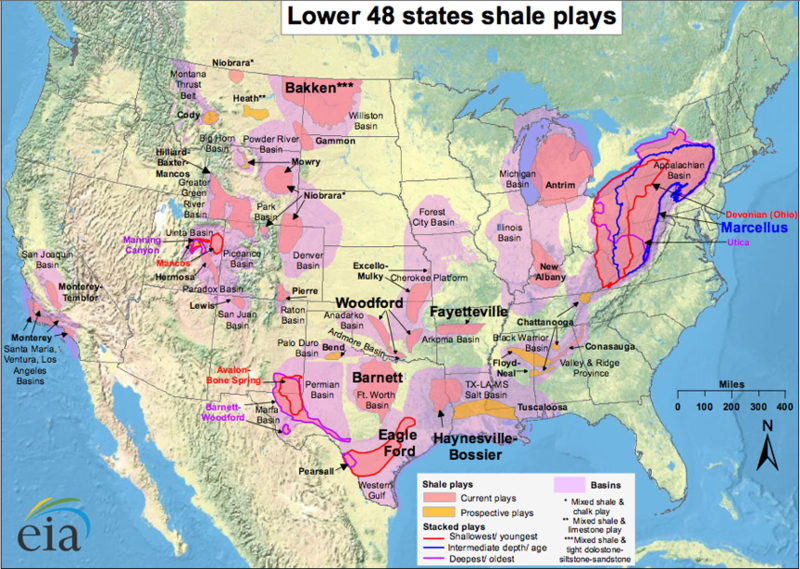 Shale plays around the contiguous United States (EIA). The most likely of still relatively unknown resources (outside the Niobrara) to be developed in the near future may well be the Tuscaloosa and the Chattanooga. The Tuscaloosa has been vertically drilled back in the 1960’s and since but with the potential to have similar attributes to the Eagle Ford, i.e. a liquids-rich resource, and it has a marketable product in those liquids that may make it more attractive. Exploratory drilling has begun, with two horizontal wells slated to be completed this year at a cost of perhaps $8 million apiece to reach the reservoir and extend a lateral running out about 7,500 ft. Whether the production will make it possible to profitably cover those costs is yet to be determined. The reservoir varies from 200 to 800 ft thick and lies at depths between 11,000 and 14,000 ft. The reservoir may contain as much as 7 billion barrels of oil. The Chattanooga, on the other hand, is a relatively very shallow gas play which may make it easier and less costly to develop, particularly if existing wells can be deepened. In relative terms, the oil production anticipated is only as yet on the order of 6 bd (from vertical wells), with 25 – 300 Mcf of natural gas. It is not, in short term likely to bring significant production to the table, at least on the basis of current prospects. And this is where the Niobrara has the greater potential. It is considered to be somewhat similar to the nearby Bakken, which has now reportedly reached production levels of around 400 kbd, with production varying between around 150 to just under 600 bd/well. The production numbers are still somewhat tentative given the small number of wells that have been produced, but EOG reports from its wells in Colorado, for example, one well with an initial production of 645 bd, though that has now fallen to between 300 and 250 bd, while a second is now running at 225 bd. The company is planning a total of 45 wells this year. Further north in Wyoming, Entek is reporting low oil flows even before fracturing. Well costs are reported to be between $4 and $5.5 million for E&D in drilling down to the reservoir which lies in the 7,000 to 8,500 ft depth and then completing a horizontal section of perhaps 4,500 ft with perhaps 18 stages for hydraulic fractures. Anadarko, which is reported to have one well that initially produced at 550 bd, is expecting to run between one and four rigs, building up to a production of around 16 – 20 wells per rig per year on a 40-acre spacing. The Wyoming section of the Niobrara currently has some 13 rigs, while the Bakken in North Dakota has around ten times that number. Rigs are, however, also reported to be in short supply. The story would not, however, be complete if one did not note that China is also aware of the play, and in January bought a third of the Chesapeake Niobrara operation. Given that one of their wells came in with an initial production of 1,270 bd of oil, and 2.4 mcf of natural gas, Chesapeake seem to retain their ability to find the sweet spots in reservoirs relative to others for whom the 200 – 500 bd average is more typical. And a final reminder from the Bakken post, of the relatively short life that can be found for a typical well producing oil from a fractured shale deposit. The other graphs in this presentation don't seem to represent a timeline but rather the "ranking" of EOG Resources. I changed the graph to remove the EOG ranking, making it the same color as the rest. Did not want to be seen to promote EOG but thought that the plot otherwise had useful information. LLS = Light Louisiana Sweet - an oil benchmark. WTI = West Texas Intermediate - main US oil benchmark. St. James = a small town in Louisiana (on the river between Baton Rouge and New Orleans), with a bunch of tank farms and (soon) another railroad (un)loading facility. Apparently the/an LLS delivery point. n.b. LLS oil sells for nearly $20/bbl more than WTI, so by shipping their oil (which fits the LLS classification) down to the Gulf Coast, bypassing the pipeline congestion at Cushing Oklahoma, they get more money for it. ROE = Return on Equity - net income as percentage of shareholders' equity. ROCE = Return on Capital Employed = EBIT / (Total Assets - Current Liabilities). (EBIT = Earnings Before Interest and Taxes). IP = Initial Production (in this context). WI = Working Interest = ownership of right to explore and develop, WI owners pay for exploration/development/production costs. Royalty Interest owners (land/mineral rights owners) just collect royalties. NAR = Net After Royalty = the oil/gas kept by the WI owners after giving a defined percentage to the land/mineral tights owner. (unfortunately sometimes Million by people outside the oil/gas industry). (MM is usually a giveaway that M means thousand). MMBtud = Thousand Thousand British Thermal Units per Day. (natural gas is actually sold by heating energy, not by volume). Bcf = Billion Cubic Feet (of natural gas). Tcf = Trillion Cubic Feet (of natural gas). The US uses a little over 20 Tcf per year. BNGLd = Barrels Natural Gas Liquids per Day. Take away: highly unlikely to be another Bakken. Sweet spots seem much more discontinuous. Clicking on your very last link: -Typical Bakken well production (ND DMR)- slide 16, they show the cost of Bakken - Three Forks P10 going to $450 a barrel and P50 going to $350 a barrel and historical prices already at about $280 a barrel. I don't understand this chart at all HO, what am I missing here? What is this chart trying to tell me? I think the lines are the production level and the triangles or dots below are the price. The chart has to be parsed a little - it is not designed well for "at a glance" reading. There are scales on both the left and right vertical axes. You are using the wrong scale with the wrong curve. You are using a production curve with a price scale. Yes of course how silly of me. And the price is the projected price by the DOE-EIA. They are projecting the price to go above $100 a barrel in about 2016. It is there already. That forecast from the NDIC, as severe as it appears, is grossly optimistic. First, there are no wells before about 2007 that produced 1000 bopd(sustained for 30 days). Second, the few wells that did produce 1000 bopd(sustained for 30 days) are in yr 4 on the forecast and are on the order of 100 bopd. That forecast is force-fitted to a pre-assumed EUR. The NDIC got their EUR from hearing exhibits presented by operators. Typically, the operators would calculate oil in place and assign a recovery factor to arrive at EUR. The co-ordinate plot of forecasted rate -vs- time makes it appear that decline is moderating. Decline does moderate, but not as optimistically as presented on the co-ordinate plot. A semi-log plot would give a more realistic picture. Great article HO, but I have to add something about the name Tuscaloosa. Most folks in the USA think Alabama football when they hear the name. Unfortunately, it has a different meaning for me. Tuscaloosa, Alabama, was named for Chief Tuskaloosa, the Native American Chieftain that Hernando Desoto defeated in the Battle of Mabila and served as the start of when my Hispanic ancestors conquered the lands that the deposit now lie below. Maybe this post belongs in the Drumbeat but when I hit the Tuscaloosa tag, this was the only thread that appeared. I always thought it was wrong to name the city of Tuscaloosa after him after what we Hispanics did to him and his people. I would feel I was not being socially conscious if I did not give it a mention. Back to the subject at hand. You mentioned two horizontal wells that are now scheduled to be finished soon to tap that deposit. Where are these wells and what is the expected yield from each? Sorry for being off topic, but I think a different name would have been a better choice. Folks should also be aware that this was once a prime elephant hunting region. Why? Simple..the tusks-r-looser. Graucho Marx in Animal Crackers? It is a classic. Really, thanks for the understanding. Humor does help. All our gear for the oil cleanup is marked MC 252 and the staff calls it the Mississippi Canyon 252 spill. We are told to say, if asked by civillians, that we work for a contractor cleaning up 'BP's mess.' Every shift, each of us has to answer questions from the masses at least once or twice. It actually makes me feel good that the contractor is interested in public relations. BP actually discussed the issue with my employer and felt it was better to keep folks 'in the know'. This seems to contridict what I have read in the press. I am actually sticking up for BP on this one point. I am sure BP has top PR folks on staff too. As with the finds that HO has been discussing, I think informing folks on the front end can go far. I have seen some negative talk of fracking in the local press, but the issue seems to gain little traction here. The MC 252 spill still dominates the local press when it comes to energy companies in the area. MC 252 and the reactivation of the Bellfonte nuclear reactor project. I am guessing that any new drilling project is met with mostly support in this area. The Tucsaloosa deposit and other deposits that are in the area have good support amongst the locals for explotation. The recent approval of a new well for BP in the Gulf of Mexico also met with more support than I would have guessed. I am thinking the rush to tap the Tuscaloosa deposit will be just fine here in Alabama and the neighboring states. Louisiana is a different story. The big issue there is loss of the wetlands. To a high degree, Louisiana folks blame energy companies and thier canals for this loss. Few believe the cause to be global warming or sea level rise. BSEE is seen as the current federal governmental devil, replacing the Army Corp of Engineers. I say good drilling to the operators, these deposits need to be explored. Just give me Texas fracking regs for Alabama, Mississippi, and Louisiana. It is your suggestion that I base my idea on. TFHG - If I'm going to steal I'll steal from the best. LOL. Wet lands loss was made worse by the added canal systems. But the biggest culprit for loss is the Corps of Engineers. By not allowing the Miss. River to divert out of the current channel virtually all the sediment goes out into the deep GOM. The entire coast line of La. has been sinking for many millions of years. How much subsidence: there are rocks at 40,000' down there that were deposited in 6" of water. You may be aware that every 25,000 years or so the course of the MR swings wide across the entire state. At one time it went through Lake Charles in far western La. But the Corps has no choice: if the MR ever diverted it would destroy the economy of the US. But La. did draw up regs years ago to aid the canal situation. If a company has to dig a new canal they have to back fill an existing one so there's no net gain. As far as Tuscaloosa development it won't be an issue: not much wet lands in the trend and what is there is very well protected by current regs. I know...I deal with them all the time. Did you know I can't pump rain water of my locations in La? Have to have it hauled to a disposal site...pay around $7/bbl to get rid of it. All of which to say there's always some damage done...it's a matter of degrees. But that's the trade off as with all industrial activity. As you say the locals have something of a conflict between benefiting for the economic effort and having to live with the downside. You've gotten to see the worst of the downside for sure. But you've also see the economic losses inflicted on locals when the drilling/jobs disappear. It's easy for someone in Michigan to say we should ban all drilling in the GOM. Just as easy for someone in Mobile to say we shouldn't bailout the auto industry and instead import all our cars more cheaply from Asia. Sacrifice is easy...especially if someone else has to do it. LOL. Wow, that's a lot of money to put into a hole. Went to the EIA and found their real cost of oil & gas wells. 1996 avg real cost 0.53 Million $. 2006 avg real cost 1.80 Million $. 2007 avg real cost 3.48 Million $. The trend would seem to indicate peaking of oil, the easy/cheap/productive stuff has been (mostly all) drilled already. but there aren't any stats on total length of hole. 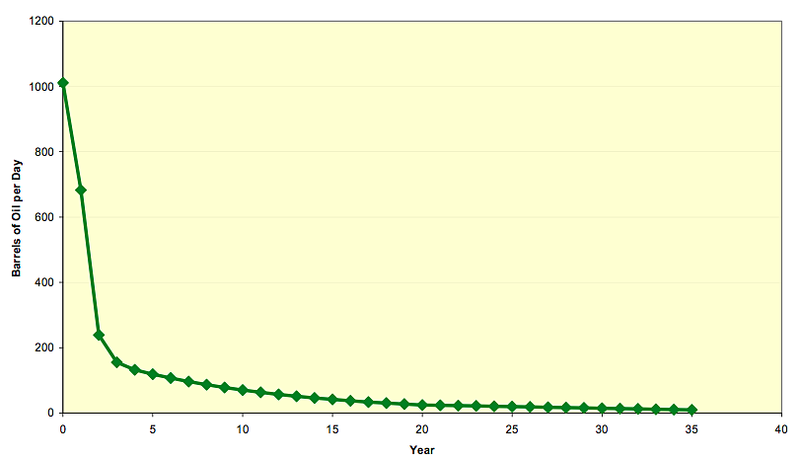 It looks to me, just eyeballing this graph that larger wells are not as common as they used to be. That percent chart looks too spookily similar for each of those years. 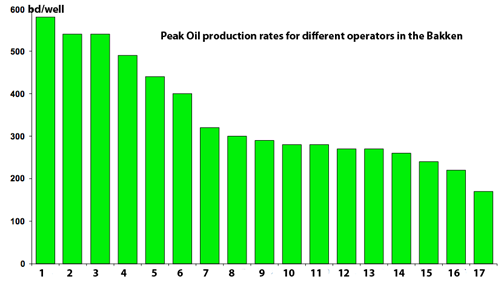 sunny - Something to remember about those high initial production rates: they start declining the first day the well goes on production. A 70% to 90% decline rate is typical. Many of the Eagle Ford wells have a 90% DR. So let's take your 800 bopd and decline it at 80%. During the 13th month it will be doing 160 bopd. So over the first year it averages 480 bopd...still damn impressive. Backing out royalty and production costs (which aren't very high) I would estimate the pre-tax revenue would be from 312 bopd X $80/bbl X 365 = $9.1 million. That's an excellent return in anyone's book. But that decline rate, just like rust, never sleeps. During the 25th month the well will average around 30 bopd net. Or about 70 bopd average for Year 2. Or $2 million net. Going forward the well drops down to stripper level. Still profitable but nothing to brag about. So the first 2 years generates around $11 million revenue for the $5 million investment. The remaining revenue stream isn't very much especially as production costs (which tend to be high at this point) eat up a lot of the cash flow. So let's add another $3 million so we get $15 million for our $5 million investment. Or about 3 to 1 in simple economics. Which is why my private company doesn't drill these plays. Our conventional deep NG drilling program targets prospects with a minimum 5 to 1. So why would Anadarko et al not go after the same prospects we do? Very simple: there aren't enough onshore conventional prospects to meet the demand of all the public companies. Just my WAG but if it weren't for the shale plays at least half the public companies would disappear. Wall Street demands that public companies replace their produced reserves y-o-y. Do that and they keep pumping your stock price. Don't and they'll quickly kick you to the curb. As the activities in shale plays increase across the country the public benefits: the profit isn't as high as conventional plays but that doesn't affect the price the public pays. The economics within each play will vary greatly. The Anadarko well may be offset just a few thousand feet away and generate less income than the cost to drill it. But it will still add to the US production base. And the fact that it lost money won't increase the price its oil is sold for...the market place determines that. Some in the public may begrudge the production the oil companies get from these plays. But in many cases it represents a wealth transfer from those companies back to the public. This expanding-bracket effect seems to explain all the upslopes on the graph. Hmmm... 2008 has the highest percentage of bracket-1-wells, but the lowest percentage of bracket-2-wells? Wouldn't we expect all the low production brackets to see increasing proportions of wells, if 'small' wells were becoming relatively more common? I fail to see much of a pattern in that chart... am I missing something? According to a study by Bentek, the Niobrara is projected to produce about 350K bpd by 2016 - presuming sufficient infrastructure is built by then. While the Niobrara shale, an emerging unconventional play in the Rocky Mountains, won't pack the punch of the Bakken, it could develop into a 350,000 b/d producer of crude by 2016, an industry expert said Friday. I hadn't heard of the Chattanooga as a liquids producer. There were some wells drilled in it a couple years ago for the gas but they weren't particularly prolific producers. The Tuscaloosa is still very early to tell how successful it's going to be. Fluffing another brain dead Texas Governor and CERA. Funny what hard economic times will do to people. Does anyone has information about the Mississippian Shale oil play in northern Oklahoma and southern Kansas? ; many of the large independents (Chesapeake, Devon , Range and SandRidge) are aggressively following this play; from what I read it is shallow thus low cost with 70% liquid content and there is an existing infrastructure in the region. N - I looked at an acreage play offsetting the SandRidge position about a year ago. Prices just started moving up. We were never going to drill...just flip the acreage. But the folks that controlled the deal got greedy and we bugged out. The document presented by the North Dakota Department of Mineral Resources seems to suggest that this kind of production requires about 2 barrels of water for every barrel of oil produced. These days they recycle a lot of that water. Will the decline in conventional and deep water oil supplies occur slowly enough for the economy to adapt to rising prices without collapsing? I do believe that if the decline were to be slow enough, we could POTENTIALLY adapt to the new conditions without actually suffering a fast die off or having to fight WWIII. Just how fast could all these various oil substitutes be brought into production?Will we be able to scrounge up the necessary capital, manpower, and resources to pull it off? My personal opinion is that once we switch modes from complacency to panic, things in the oil industry can happen several times as fast as we are told they WILL happen, based on current economic and political realities. Actually, the question is about total liquids. People like to focus on crude in order to have a consistent basis for analysis, but in the end it's the total supply of liquid fuel that determines how much trouble manufacturers will have getting supplies and shipping product to consumers. I agree - we can mobilize a lot faster than we have been. Heck, we could free up 25% of oil consumption in the US overnight with aggressive carpooling (most people live in areas dense enough for it). It seems to me that a critical point to reach is when a significant number of vehicles are PHEV or EV or more importantly when a sig number of households have at least one vehicle PHEV or EV. This should change the dynamics of liquid fuel demand/supply elasticity. For the US, not all of the 110 million households need to commute to work via cars/light trucks, or they only need to travel short distances, some who have to travel a lot already have very fuel efficient ICE vehicles, so I am guessing need about 25 million EV or PHEV to really get to that point. Once manufactures are geared up for PHEV/EV production we could see millions of EV vehicles sold per year in a climate of very high oil/ or fuel rationing. I agree: a minority of vehicles account for a majority of fuel consumption. Taxis are the best example: I believe that in Tokyo the proportion of taxi fuel consumption is quite striking. I'm seeing a lot of full hybrid taxis lately, which probably reduce city fuel consumption by 75%, so we actually have a good portion of the tools we need in large volume production already. Still, it would be nice to get a decent estimate of the water inputs required. You're right about the water inputs being a potentially huge, game-changing issue - especially in certain areas of the American west, and increasingly even in the American midwest, as severe dry weather patterns emerge and large natural aquifers like the massive Ogallala are quickly being depleted by unsustainable levels of usage. Sometimes this process of "permanently" draining aquifers (i.e. pumping out more water each year than can be recharged or re-filled by local rainfall") is criticized as essentially "water mining" or use of "fossil water" as a one-time, oil-like resource formed over millions of years (to the extent that usage exceeds recharge) and essentially used-up over just a few hundred years. However, I seem to recall that back around the 1980's, the 'fracking' method often mentioned was not hydraulic (pressurized water) but instead it was the underground use of explosives (dynamite, C4/plastique, nitrogen fertilizer-type, etc) to shatter and open-up tight rock formations, allowing natural gas and sometimes oil to be produced more quickly, and in greater quantities than before. At some point (apparently) hydraulic fracking methods seem to have become preferred over explosive methods. I would guess that additives, sand and other proppants might be easier to apply with a hydraulic methods. But I would also guess that a nitrogen fertilizer/diesel fuel slurry explosive mix might be the basis for a hybrid fracking method of some sort?? Just a guess. If water becomes as scarce as current trends suggest, then the cost of water for fracking operations could start to become prohibitive. However, the cost of water has traditionally been much more of a political goodie, than it is a free-market result. So the "true" cost of water is very likely to be masked behind an array of subsidies, monopolies, water boards, large public works projects like dams, canals, flood control, etc. And this regulatory mix will vary greatly across jurisdictions, making price predictions difficult at best. Even so, the general price pressure on fresh water will almost certainly be up (barring an unexpected break-thru in the cheap, easy desalinization of sea water). And I'm no expert in any of this, but I would guess that the cost of explosives (especially in quantity) must already be fairly competitive with cost of tons of water as a fracking input. Even if the water is "free", the surprising weight of water and the huge quantities needed for multiple fracking jobs must result in very substantial transportation costs in most cases. Of course, recycling water will greatly improve all of this. At the same time, high-tech water filtering equipment and supplies have got to be a very long way from being free or cheap. Or, maybe the problem with explosives is excessive damage to the formation? But fracking itself is a sort of controlled formation "damage", and explosive choices are quite extensive (for those with the proper credentials) and they can be combined, customized and moderated in amazing ways. It would be quite a gamble I suppose, but perhaps one day much of the oil now locked into the tight southern sections of world's largest oil field, Ghawar in Saudi Arabia, will be released? After further consideration, I realize that there must have been some very good, well proven facts that led to the current preference for hydraulic fracking over other methods. What's more, the deciders in the field are often betting large slices of their own personal wealth on the outcome. And on top of all that, I have a feeling that most men would not pass up a chance to play (I mean "work") with professional explosives unless there were pretty good economic reasons for doing so. Nevertheless, there may eventually come a day when water for fracking in certain areas is simply no longer available to the driller at a do-able price - or it becomes legally forbidden, partly due to political pressure from those who wish for an early end to oil (or think they do, until reality sinks in). That's why I'm asking about the amount of water needed for fracking. If it's only 2 barrels per barrel of oil produced then water prices will never be an obstacle to expansion of fracking, as oil will cost at least $100/bbl, and water will never be priced at anything near that. Heck, it would be cost effective to ship it all the way from the Pacific and desalinate it, if necessary. j - You're correct: there are very specific tech reasons why the hydraulic frac approach is required. Actually their goal has never been to break the rock apart to get it to flow. The shale rock itself won't flow oil/NG no matter what you do to it. The production coming from all these fractured shale reservoirs is coming from the existing fractures in the rock. It took millions of years for the hydrocarbons in the rock matrix to seep into the fractures. The commerciality of a horizontal well is a function of how many fractures it cuts. That's why hz wells are favored over vert ones: the fractures are more vertical in nature and thus easy to miss with a vert well. The goal of the frac job is to reach out to fractures close to the hz well but not penetrated by it. So think of the induced fractures as little wells reaching out. I've used the explosive system you described many time. It's meant to open up the rock just within a few feet of the wellbore. Typically to repair formation damage caused by drilling or production. Commonly called a "gas gun". In many cases the explosive is the fuel used to propel those man-portable surface to air Stinger missiles. It produces a very fast high frequency shock. The other critical aspect is that if you fractured the rock without filling the fracture with proppant, like sand, it closes back up. BTW: I know of a company that is now marketing a water reclamation system for produced frac fluids in the Eagle Ford trend in Texas. They claim to be able to reuse 90% of the frac fluid water. Besides conserving water resources, their system should be a big winner: in Texas you have to dispose of those nasties in deep injection wells. Between transportation and disposal costs it can run $6+ per bbl. Got 100,000 of frac fluid to get rid of: $600,000+. And then you need to buy more water for your next frac job. I'm sure their system isn't cheap but hopefully cheaper than the current protocol. The document by the ND Dept of Mineral Resources seems to suggest that fracturing requires about 2 barrels of water for every barrel of oil produced. Nick - I've never actually seen that metric used before. I do know a big frac can use around around 30,000 bbls). I think the largest frac I've ever heard of is 100,000 bbls. So 2 bbls water for every bbl of oil seems high in general. I saw your comment the other day but couldn't find that chart I think you're referring to. Maybe I read it too fast but was it showing the amount of water used to frac? I thought it was indicating how much water was being produced with the oil. In that case this water has nothing to do with the frac fluid. It would be the water originally in the rock that's being produced along with the oil. So, for that big 30k bbl frac - maybe it would produce 30k bbls over its lifetime, and we'd get a 1:1 ratio? Now, if Bakken wells are producing 2 barrels of water for every barrel of oil, and that water can be reycled to to produce at least 1 barrel of pure water, then it would appear that Bakken wells need zero net input of water! Nick - I'm still a little lost. Are there two "waters" we're talking about? 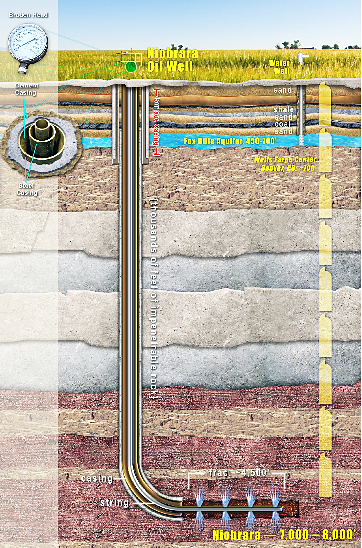 The water used to frac a well and the water produced during the oil production phase. The frac water that's produced back only last for days and that volume has no relationship to how much oil the well will produce. The Bakken wells need water to be frac'd but no water to produce them. The amount of formation water produced with the Bakken oil will be related to the amount of oil produced in that well in the sense that the longer that is is produced the oil and water URR of both will increase. I get the impression that you think the frac water is produced over the life time of the well. Nope: just for a few days or weeks at most. Again, I couldn't find that chart but I think it was noting the amount of formation water produced with the oil...the "water cut". That's one aspect that's different about the Bakken most of the fractured shale reservoirs: they produce little or no water...ever. The water used to frac a well and the water produced during the oil production phase. The frac water that's produced back only last for days and that volume has no relationship to how much oil the well will produce. Yes, I understand that the water used to frac a well is needed only for a short time, and then the well produces oil for years, albeit with a relatively steep decline in production. And, yes, I'm clear on the difference between water used to frac a well, and the well produced during oil production. On the other hand, as you've noted often, Bakken wells as well as other fractured shale plays require constant drilling, which means that frac water is needed on a fairly constant basis. It appears to me that the water used during the oil production phase could be purified (by reverse osmosis, distillation, etc) and used for fracturing. What I'm really trying to get at: I've read a number of comments on TOD that suggest that the water needed to frac wells is a real problem: that it might be a burden on local water supplies, and that a scarcity of water might limit fracturing efforts in the future. This appears unrealistic to me, given the relatively small amount of water needed relative to the value of the oil produced, the possibility of recycling, and the availability of water produced during production that could be purified and used if necessary. What do you think? Nick - I understand now. I'm not a frac expert but the frac fluid is a complex mixture of chemicals. Produced water is almost always salty and can't be used. But along those lines I mentioned the other day a company that developed a system to treat produced frac fluids and reuse them for another frac. I'm not sure how economical their approach is but they are now marketing it in the Eagle Ford. I'll check in with them and see how it's going. This story seems to be a little behind the curve, at least for Wyoming. I live in the middle of the Niobrara effort here, and it seems to be all over but the shouting. We endured an early landrush, but almost none of the wells that have been drilled (at least according to rumor and public speculation) appear to be economical. Public utterances from groups and government have gone from over-the-top optimistic to downright grumpy. (Colorado seems to be producing some oil from the Niobrara..). The latest public utterance from a story in the Casper Star-Tribune..
ROCKMAN probably has a quick ballpark figure for what per well completion/production cost that sort of flow could support. but the flows certainly aren't up to those from the well they were chasing. 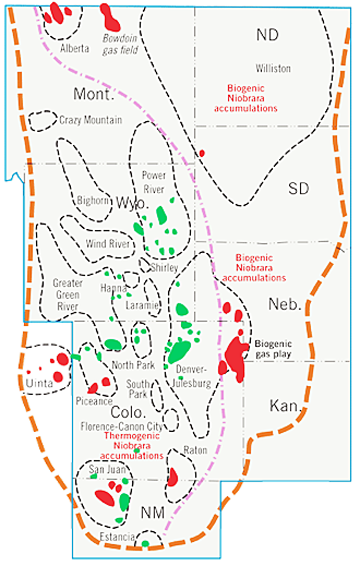 EOG Resources’ Jake 2-01H well in Weld County, Colo., started the Niobrara excitement in 2009 when it produced the equivalent of 1,500 barrels of oil a day. It still produces between 250 to 300 barrels of oil a day (from the same linked article). Luke - One way to look at it is the payout time. That's related to rate of return so it's a fair guestimate approach. Most companies are very happy with p/o of 2 years or less. And 3 - 4 can be acceptable. But, again, why so many of these fractured shale players are public companies: profitability is secondary after adding reserves y-o-y to keep Wall Street happy. As far as using one or a limited number of flow/decline rates to characterize such a trend: a fool's game and the con man's favorite tool IMHO. In any trend you can immediately offset a hz well that came in at 1,000 bopd and produced 400,000 by another well that came in at 100 bopd and never recovers half its cost. You can also put a well on at a high rate and go non-commercial in a few months. Not very common but I've seen wells come on at several 100 bopd deplete within a month. Drilling a fractured shale reservoir is a statistical game. For every great well the companies put out big press releases on, there are many wells at the far low end of the spread. You won't see anyone bragging about bringing in a 100 bopd Niobrara well. But, again, why so many of these fractured shale players are public companies: profitability is secondary after adding reserves y-o-y to keep Wall Street happy. So they release all the good news they get. You won't see anyone bragging about bringing in a 100 bopd Niobrara well. The investors read the news and draw conclusions. Drilling a fractured shale reservoir is a statistical game. For every great well the companies put out big press releases on, there are many wells at the far low end of the spread. It is the worst possible bias a statistic sample could get and most of the investors know it or ... until eventually reality catch up. No doubt that the regulatory environment from fracture stimulation is more friendly to Texas operators than those in Pennsylvania and New York. In many areas, as much as 50% of the frac fluids are currently recycled. Many different frac fluids have been used over the years, such as sand-water fracs, fracs with lease crude, acid fracs, inert gas fracs using nitrogen foam. All of these utilize a proppant, such as sand mined from geologic outcrops, to manmade ceramic proppant manufactured by Carbo Ceramics. (search Carbo on my blog for a review of Carbo's frac successes. )The combination of fluids vs. proppant depends upon the mineralogy, number of natural fractures, thickness, and rock mechanics. The future of all the shale plays share their story with what was learned in the past. Longer and longer laterals combined with increasing the number of frac stages leads to higher initial production rates and higher rates 365 days out. There are plans for some 40,000' laterals in Alaska. The Niobrara Formation was deposited along the Cretaceous interior seaway and covers an area several hundrediles wide from New Mexico up through Alberta. The formation names change slightly, but they are all Niobrara age rocks. I have posted a Chattenooga shale isopach at www.petroviews.blogspot.com. The thickest deposits trend northwest-southeast through Franklin, Lawrence, and Winston Counties. There are plans for some 40,000' laterals in Alaska. Is that supposed to be part of Great Bear's shale oil proposal or part of a more conventional play farther north? Great Bear may get the production they are hoping for from the Triassic-age Shublik, the Jurassic-age Kingak and the Cretaceous-age Hue source rock but they haven't drilled a single hole into any of them on the North Slope yet. Great Bear hopes to begin producing crude oil and natural gas liquids, or NGLs, in 2013, in three 15-year-phases that call for about 200 factory wells a year, once it drills four 11,000-foot core holes in the second half of this year and four production test wells in 2013. Considering they were supposed to drill two holes last winter and didn't I wouldn't consider the schedule they have laid out all that concrete just yet.